I am on old latop running Windows 7 64bit with Intel Pentium Dual-Core CPU T4400 processor with built-in Intel 4 Series Express Chipset Family. OpenGL version 2.1 (very old). But Blender v2.79 works fine with it. And I on 32bit Lazarus v 1.8.4. I understand this computer is not for 3D. But, anyway, In CGE 6.4 work most of examples. All UI examples work fine. zombie_fighter works fine. And view3dscene.exe may load simple models. But when I load X3D from demo-models to view3dscene.exe or when I use my project the same as https://castle-engine.io/manual_load_3d.php using Scene.Load() I am getting the error message. Using Blender I create a simple model. Exported it to X3D and tried to load it with view3dscene or my project. The error message is the same as above. Which version of Microsoft Visual C++ Runtime do you use to build CGE 6.4? Maybe I need to reinstall it. 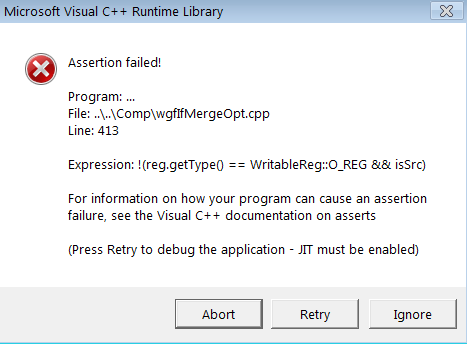 You should not need to install Microsoft Visual C++ Runtime. Hm, this looks more like a bug inside OpenGL. See if you can open in this view3dscene the models without error. Both versions are working fine without any error messages. and I was able to open my models which I exported from Blender to x3d and I even tried to export it .3ds - it works fine. What does it practically mean? I should use CGE 6.5? BTW I tried another viewer - FreeWRL (https://sourceforge.net/projects/freewrl/)- it may open the models without any errors. You mean view3dscene from snapshots just worked, without the need --debug-enable-fixed-function? Then yes, it means that the issue is fixed in Castle Game Engine 6.5:) View3dscene from snapshots is using CGE 6.5. You can get latest CGE from GitHub ( https://github.com/castle-engine/castle-engine/ ), or even download a snapshot (announced this weekend, https://castle-engine.io/wp/2019/03/31/engine-news-6-5-release-snapshots-improvements-to-editor-tcastlewindowbase-joysticks-and-more/ ) from https://github.com/castle-engine/castle-engine/releases/tag/v6.5-snapshot . We most probably added the GPU you use to force using fixed-function pipeline (older, but more stable on old laptops). The first time I tried it with --debug-enable-fixed-function I wrote it did work well. Now I tried both 32bit and 64bit version of the latest view3dscene without this parameter on demo-models and on my models. It works fine too without this parameter. So I will try to install v6.5 snapshot and it will try to create to use it in my test project to load a simple X3D model. I tried to compile my project: it works fine - it loads correctly my X3D model. And I compiled several projects in castle_game_engine\examples. The projects run well. Thus I will start using the snapshot instead of version 6.4.